General elections in St Lucia and Guyana on November 28have raised serious questions about the financing of campaigns and the unfair use of state resources by governing political parties to gain an advantage over their opponents. International observers from the Commonwealth and the Organisation of American States (OAS) commented unfavourably on campaign financing in both countries. The OAS Observer Mission in St Lucia pointedly called for legislation, including strengthening the Integrity Commission and auditing and reporting mechanisms, and it noted that “Saint Lucians have no access to information regarding campaign financing by the parties”. A similar observation was made by the Commonwealth Observer Group who said “the requirement for declarations of election expenses by parties after the election is not adhered to and the law in this regard is largely symbolic”. What is significant is that despite the fact that the ruling parties spent more on their campaigns and manipulated state resources to boost their prospects, the opposition parties did extremely well. 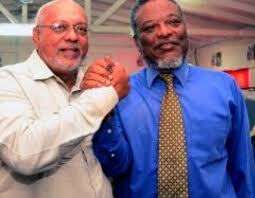 In St Lucia, the SLP defeated the UWP overwhelmingly to form the government. In Guyana, the opposition parties, A Partnership for National Unity (APNU) with 40.8 per cent of the votes cast and the Alliance for Change (AFC) with 10.3 per cent enjoyed enough support to deny the PPP/C the overall majority in the National Assembly that it had since 1992. Consequently, having secured 48.7 per cent of the voter turn-out, the PPP/C, although it won the Presidency on a plurality of the vote, has had to form a minority government. Of the 65 member National Assembly, the PPP/C has 32 seats and the combined opposition has 33 with 26 held by APNU and 7 by the AFC. In Guyana, the new President, Donald Ramotar – elected on a plurality of the vote (as the Constitution provides) not an overall majority – has formed a minority government made up of PPP/C members only. This has created a great deal of bitterness among the supporters of the main opposition party, the APNU which is a combination primarily of the Peoples National Congress founded by the late President, Forbes Burnham, and the Working Peoples Alliance founded by the late historian Walter Rodney. Whether this new arrangement will work in Guyana is left to be seen. Certainly, the combined opposition parties have an opportunity to bargain with the minority PPP/C government over the areas in which money will be spent and how. They are also in a good position to insist on parliamentary oversight committees that will closely examine the operations of key ministries. And, in the financial analysis, they could vote against the Government’s Budget and bring government to a halt, thus forcing a new election. Despite APNU street protests in the immediate aftermath of the Guyana elections – one of which involved Police shooting pellets at participants - APNU leader, David Granger, said on December 6 that the election results have cleared the way for the politics of ‘inclusionary democracy’. He also stated that the APNU will “pursue our legislative programme to ensure that laws are enacted to provide jobs for our youth; to provide relief from the burden of taxation; to alleviate the suffering of our people; to expose and root out corruption and to eliminate discrimination and marginalisation”. Nonetheless, the failure of the two ruling parties in St Lucia and Guyana to win the elections overwhelmingly indicates that high spending - while it may have captured a small number of voters – is no longer a decisive weapon. Big spending on advertising, musical extravaganzas and give-aways, and abuse of state resources by ruling parties will not buy an electorate that is dissatisfied with performance.